The 3-inch Gun Motor Carriage M10 (or the M10 GMC, unofficially the Wolverine) is a Rank II American tank destroyer with a battle rating of 3.7 (AB/RB) and 3.3 (SB). It was introduced in Update 1.49 "Weapons of Victory". The M10 GMC takes much from the M4A2 Sherman which it was derived from. The drivetrain is identical with the drive shaft running from the engine in the rear to the front transmission and sprockets. The hull is sloped to a larger degree. The 3-inch (76 mm) cannon originally mounted on the experimental M6 Heavy Tank lacks the muzzle brake of the 76 mm M1A2 gun used on the later Rank III Sherman's and the M18 Hellcat. The turret is a pentagonal shaped M5 Mount type. Suspensions wheels are 20 mm thick, bogies are 10 mm thick, and tracks are 30 mm thick. 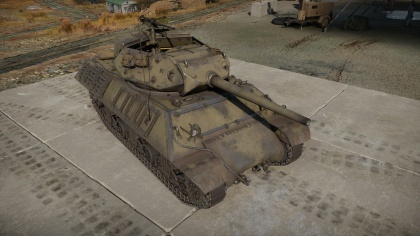 The armour of the M10 is quite decent for the rank and can make shells ricochet when angled properly, but nonetheless the armour is not thick enough to resist the stronger tank weapons of Rank II. The thickest part of the front hull is the 51 mm lower plate and the upper plate is 38 mm, though both are sloping at 55 degrees from vertical. The sides and back are only 19 mm slightly angled and thus can be penetrated by most weapons stronger than a 12.7 mm machine gun. This fact is made worse by positioning of ammo racks on the sides, making it easy to one-shot the M10 with a side penetration. The turret has slightly better armour with the gun mantlet having 57 mm angled at 45 degrees on the front, but it is still very weak on the sides and back. The front of the turret can often eat shells as the shell will fragment on the initial armour, and the massive breach of the 76mm cannon will often absorb most if not all of the spalling, leaving the turret crew untouched. This will take the M10 out of combat, but when backed up by team-mates it is possible to reverse away to repair. The turrets top is exposed and because of that artillery barrages and HE shells are much more lethal to the crew. One should avoid angling the armour a great degree as it may expose the weaker side armour at a more perpendicular angle. 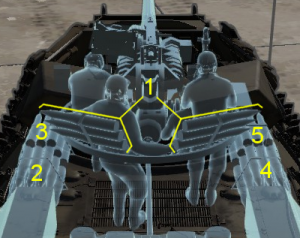 For those fighting the M10 from the front, firing towards the upper left side of the hull glacis (towards the right from the firing perspective) will be able to knock out both the driver and/or gunner if the shot penetrates in the right angle. If this does not completely destroy the tank, it certainly has crippled it and the follow-up shot should go towards the opposite side to knock out the rest of the crew. Repeat if necessary in cases where the crews are still active inside the tank. It is also a good idea to shoot the bottom of the hull to disable the transmission if the M10 is trying to flee. The M10’s side is lined with ammo racks and it’s extremely easy to one-shot the tank. Simply aim below the turret, shoot the side and the ammo should explode in a blaze of glory. If the ammo does not explode the first time, then try shooting the same spot again or aim more to the front front of the hull to knock out any remaining crew. It is possible to blow up the fuel tanks or set it on fire by shooting the rear of the M10, worse case at least the engine will be disabled. There is not a whole lot of places to shoot at the back of the M10, though a shot at the turret can knock out the turret crew or a shot in the hull can cripple the engine. Two ammo racks are present at the rear of the turret, but these racks are most likely empty as 1) They are the first two to run dry and 2) Players will usually keep this empty with reduced ammo load. The best place to shoot in the rear would be the engine to immobilize the M10 and potentially set it on fire. The M10 has roughly the same mobility characteristics as the M4 Sherman’s. Spaded, the tank moves surprisingly fast in a straight line, but the turning speed is a bit sluggish as well as the reverse speed. The M10 struggles while driving on inclines due to its narrow tracks. All in all the M10's mobility is moderate and it can get to its location reasonably fast. The 3-inch (76 mm) cannon is a wonderful and powerful gun. APCBC ammo can penetrate any tank on the battlefield even from long range. The M10 also has AP ammo with no explosive filler that has higher penetration, but does less post-penetration damage. Because APCBC has enough penetration, the AP ammo is less useful, although carrying a few of these shells could prove useful in certain situations. It is not a bad idea to carry HE ammo as well to fight lightly armoured and open top tanks like the M16 SPAA. The powerful gun and potent ammunition makes the M10 a good sniper vehicle at its battle rating, especially with its -10° gun depression, giving the M10 the ability to maximize a hull-down position. Unfortunately, even though this tank destroyer does feature a turret, its turret rotation speed is extremely slow (< 4.0°/s) due to its historic configuration of only possessing a hand crank for the turret traverse. It is possible to crest a ridge and watch as the enemy rotates their turret, takes aim, and shoots the M10, all while the latter is rotating its turret into position. Thus, it is better to see it as a regular fragile SPG instead of a turreted SPG and fight from a distance and in possible concealment. 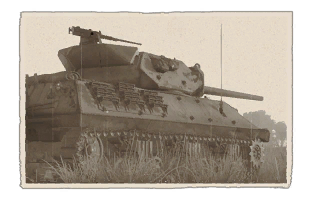 Take warning that the gun's excellent penetration is too much for lower rank tanks and can lead to over-penetration, thus dealing less or even no damage to the enemy. Also, start each round with at least six missing shells (as detailed in the Ammo Racks section) to remove the ammo racks on the rear of the turret, reducing turret penetration vulnerability to an instant cook-off. The M10 is a support vehicle. Find a good sniping position and lay behind the team taking out enemy tanks from a distance. Try to stay away from enemy tanks to avoid getting destroyed quickly. If fighting in a close quarter’s environment, do not try to push forward without support. Stay back a couple of paces and let the teammates with heavier tanks charge in. If in a close quarter scenario on maps like Poland or Normandy, utilize the tank's turning speed to rotate the turret to the right angle. The M10 can turn faster than it can rotate and using its high speed when at high gear can produce some interesting skids via the physics engine to swerve the M10 to angle its gun at an enemy tank around the corner. It is recommended to understand and get a good feel of the M10's mobility and horsepower on dirt and paved roads before attempting this stunt. First off get all protection modifications: Parts and FPE. After that move on to research modifications from the Firepower tree: Turret Drive, Adjustment of Fire, Elevation Mechanism and M79 shot. Lastly research the Mobility tree: Tracks, Filters, Engine, Transmission, Suspension, Brake System. Main cannon penetration and damage is very good for the rank and BR, can knock out many tanks in one hit. Mantlet sometimes absorbs shots with its sloped armour. Good gun depression of -10°, perfect for hull-down positions. Frontal glacis is somewhat bouncy due to steep angle. 5 crew members to replace 3 incapacitated crew members, plus one more with Crew Replenishment modification. Turret is sloped that can bounce some incoming shots. Storage bustle on the rear of the turret helps protect it by absorbing shots aimed at it. Turreted purpose-built tank destroyer allows for wide field of fire compared to casemate designs. Pintle mounted HMG can offer effective anti-aircraft fire. A lot of camouflages to unlock with relative ease. Access to modification "Add-on Armour", that actually helps a lot. Has relatively no problem when getting uptiered. One of the slowest turret traverse in the game. Reload rate slower than other US tanks at its BR. Top hull armour is extremely thin. Easy to one-shot from the side by exploding the ammo rack. Poor turning abilities, especially while not in motion. Narrow tracks, which offer poor off-road performance. The vehicle is vulnerable when targeted by artillery barrages due to weak armour and exposed crew. Very vulnerable to planes strafing from a high angle. Even light machine guns can take out the entire turret crew quite easily. Conceived after the Battle of France, the US Army employed a doctrine to fight against the expected massed armoured attack the Germans had employed with their Panzer Divisions. The doctrine called for a Tank Destroyer Branch that would be held in reserve to be deployed against an armour attack. The first few vehicles produced on this concept was the 37 mm GMC M6 and the 75 mm GMC M3. While adequate, these were only seen as a stop-gap measure until better tank destroyers could be developed. With requests being sent for a 3-inch Gun Motor Carriage (GMC), a proposal was made in November 1941 for a turreted tank destroyer that would use the chassis of M4A2 Sherman and armed with the 3-inch gun from the M6 heavy tank. The resulting prototype was standardized in June 1942 as the 3-inch Gun Motor Carriage M10 in June 1942. Production started on the M10s in September 1942 at Fisher Tank Arsenal at Grand Blanc, Michigan with a production priority rating much higher than even the new M4 medium tank. Due to the concerns of not meeting production demands, a separate variant developed on the M4A3 chassis as the M10A1. Production of these two vehicles would run until December 1943 (M10) and January 1944 (M10A1) for a total production number of 6,706 vehicle produced, 4,993 M10s and 1,713 M10A1s. The M10 received their baptism of fire in Tunisia, with the Tank Destroyer putting their doctrine into practice at the Battle of El Guettar on 23 March 1943 against the 10th Panzer Division. Afterwards, the Allies found themselves on the offensive while large-scale German armoured punches became sporadic and scarce. Discontent with valuable guns and vehicles being left in reserves, a tactic was devised by Lt.Col. James Barney of the 776th to use the M10 in an artillery role with their 3-inch guns, a role the M10 found itself in during the fighting in Italy. The M10 was also deployed as the standard equipment in 11 Tank Destroyer battalions during Operation Overlord, serving alongside M18 Hellcats and towed guns in the same tank destroyer role. Due to once again the armour engagements in Normandy and the rest of France to being scarce, the M10 found themselves supporting infantry advances into German territory. In July, encounters with Panther tanks shocked the tank destroyer crew as there was a belief the armaments were capable of easily dealing with the new German tanks, and complaints were made for the fielding of a better gun on the field. The solution came in the form of the M36 Jackson with a 90 mm cannon and the T4 HVAP ammo for the 3-inch gun. Towards the end of 1944, the German Ardennes Offensive (Battle of the Bulge) caused the M10 and the other employed tank destroyers to face off once again against a dedicated armoured punch of Panthers and Tiger II tanks. During this campaign, a deception mission was launched by the Germans named Operation Grief, which had ten Panther tanks dressed up to look like M10s externally to fool Americans. All of these mock-ups were destroyed by battle or scrapped after it. After the Battle of the Bulge, the majority of German armoured forces have been dwindled and armour engagements largely declined in the final months of the war in Europe. One of the M10's most notable action in 1945 was done on January 26 in the Colmar Pocket when the most decorated soldier of World War II, Audie Murphy, used a knocked out M10's M2 Browning machine gun to hold off a German counter attack of six tanks plus infantry while calling in artillery. He held for an hour and killed about 50 German soldiers from behind the burning M10 wreck, forcing the tank units to retreat due to loss of infantry support. Audie Murphy was awarded the Medal of Honor for his actions. After the end of World War II, most M10s were scrapped or given away as part of the Military Assistance Program to other allies. This page was last edited on 16 March 2019, at 12:47.